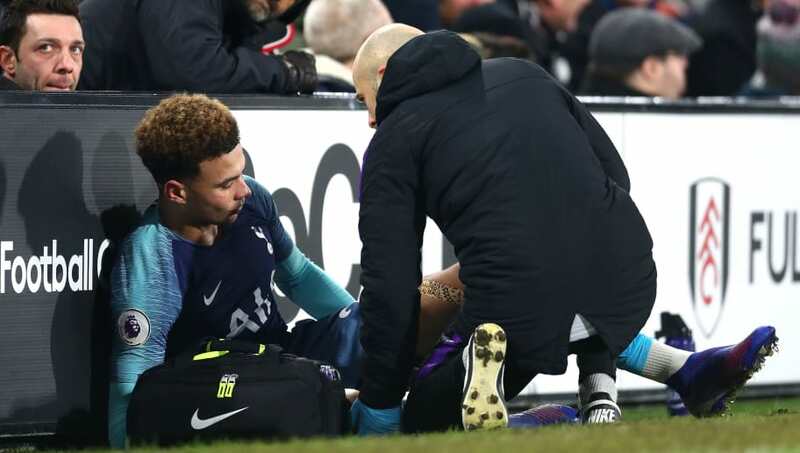 ​Dele Alli suffered a suspected hamstring injury during Tottenham's 2-1 win over Fulham in the Premier League on Sunday evening. Tottenham were initially behind after Fernando Llorente scored a first-half own goal, but a header from Alli and a dramatic late winner from Harry Winks secured all three points for Mauricio Pochettino's side. ​Alli wasn't able to finish the match, pulling up with eight minutes left on the clock after clutching his hamstring following a collision with Ryan Sessegnon. The midfielder received some treatment on the side of the pitch but the ​Tottenham coaching staff weren't prepared to take a risk and replaced him with Georges-Kevin N'Koudou. 86 - Dele can't continue. N'Koudou went on to have an instant impact, providing the assists for Winks' late winner - his first since joining Spurs back in 2016. Tottenham are already without plenty of first team stars, including top scorer Harry Kane, who is set to be out until March with the ankle injury he sustained during Tottenham's defeat against Manchester United last weekend. Mauricio Pochettino provided an update of the injury from his perspective, saying, as per ​Goal: "We need to assess him in the next few days but the hamstring is a muscle that you need to be careful with, the mechanism of the injury. "We need to assess in the next few days, but of course it doesn't look great. "On the pitch, I think we all agree that when you see him put his hand on his hamstring it's a situation where you feel...it's not great to see that."